The National Weather Service has confirmed two tornadoes touched down in eastern Oklahoma and is chasing reports of multiple other tornadoes as part of severe thunderstorms Friday night. 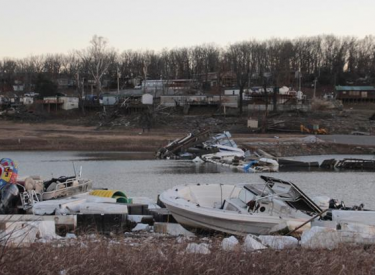 Meteorologists said Sunday a tornado with peak winds of 115 to 125 mph caused severe damage in northwestern Sequoyah County. Multiple homes, boats and power lines were destroyed. The tornado traveled at least 25 miles northeast, though investigators are still determining its end location. Another smaller tornado developed earlier in the evening near Webbers Falls which uprooted trees and damaged irrigation systems and barns. That tornado traveled about 7 miles just past the town of Gore. Up to three other tornadoes are being investigated in eastern Oklahoma and western Arkansas. No injuries have been reported. Severe thunderstorms also raked Illinois and Missouri on Saturday. One person was killed in Missouri.